Who are prosumers, and what are aggregators? The Serbian public is not quite informed yet, but decision makers and experts at the country’s public companies, energy regulator, and universities are not only aware of the coming trend, but are discussing the technical and regulatory requirements of connecting prosumers to the grid at gatherings such as the workshop organized by the Association for Sustainable Development (ASOR) on September 12 in Belgrade. At the workshop themed Energy Transition in Serbia: Guidelines and Challenges, which ASOR organized in cooperation with the European Climate Foundation (ECF), professor Miroslav Kopečni, PhD, a member of the ASOR Program Committee, presented the conclusions of the first two workshops held as part of the Mobilization and Inclusion of Stakeholders in the Process of Creating Serbia’s Sustainable Energy Policy project. Professor Kopečni says that the prosumer project in Serbia will require enormous funds, and that a political decision needs to be made to introduce them. However, the concept of producing electricity from renewable energy sources for self-consumption and feeding surplus electricity into the grid (producer + consumer = prosumer) is certainly knocking on the door – and will become a requirement once the EU adopts the Fourth Energy Package, also known as Clean Energy for All Europeans, says Kopečni. Kopečni also recalled the outstanding issue of whether Serbia will switch from the feed-in tariff, which expires at the end of 2018, to the feed-in premium or auctions as the model for incentivizing renewable energy sources, noting that no investor can seek a loan for a renewable energy project without this piece of information. 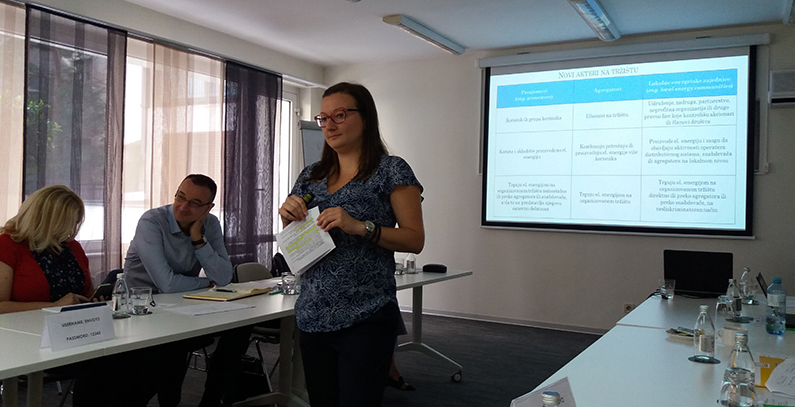 Varvara Aleksić, energy and environmental law expert, “unpacked” the Fourth Energy Package for the workshop participants, presenting the legal challenges of integrating new market participants – prosumers, aggregators, and local energy communities. For the broader public, Aleksić explained that prosumers are market participants who use, store, and trade electricity, independently or through aggregators. Aggregators are market participants combining the electricity consumption or production of a number of prosumers and trade it on the market, while local energy communities are associations, cooperatives, partnerships, non-profit organizations or other legal entities controlled by shareholders or stakeholders. “The consumer assumes the role of an active participant in the organized electricity market, which practically means that every consumer can install solar panels or wind turbines at home in order to not only produce electricity for self-consumption, but also to offer any surpluses on the market, sell it, and be remunerated for it. This enables the consumer to actively reduce costs and increase income,” Aleksić tells Balkan Green Energy News. Consumers also have an option to associate or set up local energy communities, gathering multiple prosumers to meet own electricity demand and be more competitive on the market when selling surpluses, Aleksić explains. Participants in the workshop also raised the question of how distribution system operators (DSO) in the region will look on local energy communities in terms of grid maintenance given the trend to attempt charging the maintenance cost to local energy communities. Prosumers already exist in Serbia, but their exact number is impossible to determine, as consumers who install a solar panel or another generating facility “behind the meter” are invisible to the energy distributor, professor Aleksandar Janjić, PhD, of the Faculty of Electronic Engineering, University of Niš, tells Balkan Green Energy News. “Based on discussions with companies installing solar panels in Serbia (Sunčica, Conseko, Telefon Inženjering), there are between 100 and 200 small systems connected to the grid. These are predominantly small household solar systems with an installed capacity of between 1 kW and some 10 kW,” says Janjić, adding that surpluses are for the most part fed into the grid, but are not metered. Part of prosumers have technology in place preventing surpluses to be exported to the grid. The only way to sell excess electricity is to have a system in place that is separate from the existing installations and is equipped with a separate meter. This energy is purchased by the public supplier, which is required to do so under the law, says Janjić. Asked what the regulatory constraints are in his opinion when it comes to feeding surpluses into the grid, Janjić says the most useful regulatory development would be to pass a decree on net metering, which would regulate the metering of surplus electricity exported to the grid. “Only then would strong incentives be created for the installation of solar panels for self-consumption, while surpluses would be used to reduce electricity bills,” says Janjić. 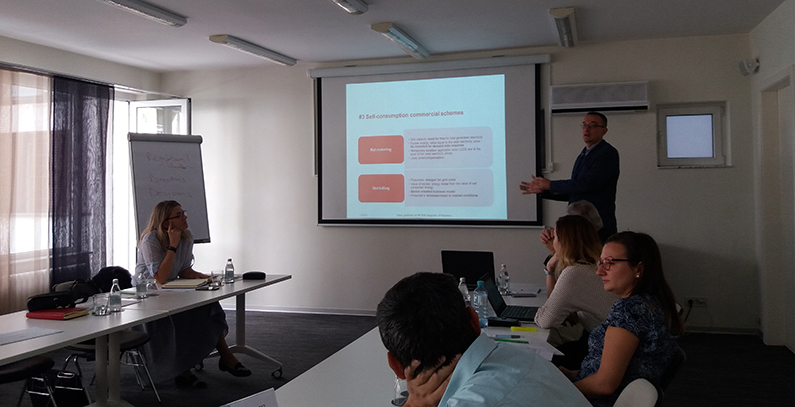 At the workshop, Dalibor Muratović, director of the Directorate for Distribution at Elektroprivreda Republike Srpske (ERS), the power utility of Bosnia and Hercegovina’s entity Republika Srpska, presented the Policy Guidelines 01/2018-ECS on the grid integration of prosumers published by the Energy Community Secretariat in February 2018. The recommendations refer to the legal and regulatory framework, meeting technology and capacity criteria, self-consumption commercial schemes, excess energy treatment, grid tariffs, VAT and other levies, imbalance settlement, and grid connection. Some of the recommendations are that prosumers should shoulder part of system costs, i.e. assume the responsibility for the associated grid costs or grid capacity they use for production, and that it is important to establish a market principle averting cross-subsidization, which is achieved through net billing. Sonja Risteska of German think-tank Agora Energiewende concluded the workshop by addressing energy transition in the Western Balkan countries and the advantages of regional integration. Agora Energiewende is currently working on two regional studies that should help boost the share of renewable energy sources in the region – one refers to increasing system flexibility in the circumstances of regional integration and the other to reducing financing costs for renewable energy projects through a de-risking facility. 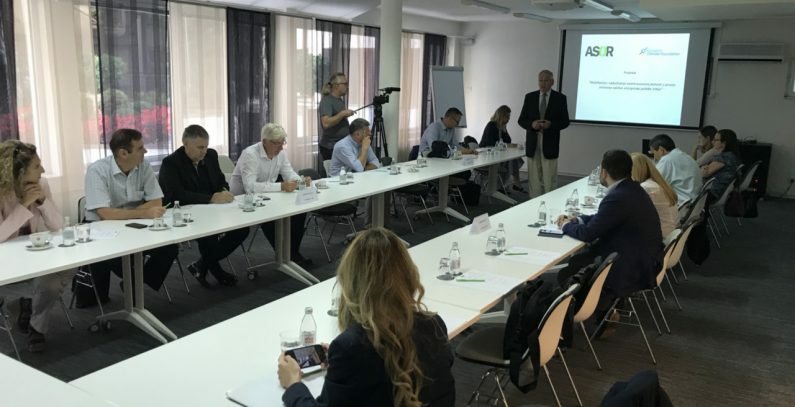 Risteski also presented the first regional energy transition think-tank in the Western Balkans, whose members include ASOR and the RES Foundation from Serbia.